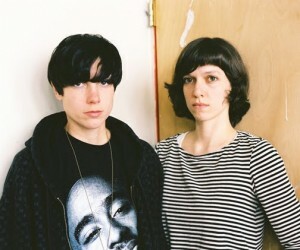 Telepathe’s sound can best be described as the Yeah Yeah Yeahs as a Suicide tribute band. They are a pop group, but possibly the most avant-garde pop group in the world. They are a noise group, but possibly the most accessible noise group in the world. Their debut LP, Dance Mother (released last April), boasts a barrage of noisy synthetics underscoring vocals that are shockingly catchy and endearingly juvenile. After having to cancel a show at Johnny Brenda’s last year to bail a friend out of jail, the Brooklyn duo (comprised of Busy Gangnes and Melissa Livaudis) finally made it back to Philly for the first time since the album dropped. On February 4th they found themselves only a block away from Johnny Brenda’s at the slightly smaller and slightly hipper Kung Fu Necktie. Although far from packed, the venue was reasonably filled with a crowd mimicking the careless androgyny and practiced dejection of the band. As the set opened with anti-anthem “Chrome’s On It” the audience slowly clamored toward the stage, attempting to maintain an air of indifference as they inch closer to their heroines.